I love sequins. I love stripes. I love this sweater. Stripes and sequins might just be the best combination ever (worn before here)! It took my day-to-day uniform (skinny jeans, flats, and a striped shirt) up a notch! I've never been fond of wearing heals when I'm running around shopping. I hate feeling too fussy--sparkles are enough for me. My shoes of choice are almost always a cute pair flats. I admire girls who rock them as much as heels (like Jessica Biel and Olivia Palermo). I've got my eye on this Tory Burch pair. o my gosh, i love everything about this outfit!!! i recently did a lookbook with stripes and trench coat too! Ahh! I love that top! Super cute! I love sequins and stripes too, and this combination feels so right on you! Beautiful trench, too! The lines in all these photos are so perfect! I feel like I'm watching you hang out near the ocean with the cool breeze through your hair. Everything about this is perfectly chic and fun. love that you have a sweater that combines both stripes and sequins! perfect mix of classic and bling! A very classic look. I rocked my Tory Burch shoes today. Sequins and Stripes! Oh man, gorgeous! I feel a DIY coming on! taylor you gorgeous thing! Love this outfit, anything sparkly and stripes is good in my book!! I want those TB flats. They look super comfy and the poppy red colour is easy to wear. Nice price as well. I'm OBSESSED with that sweater. 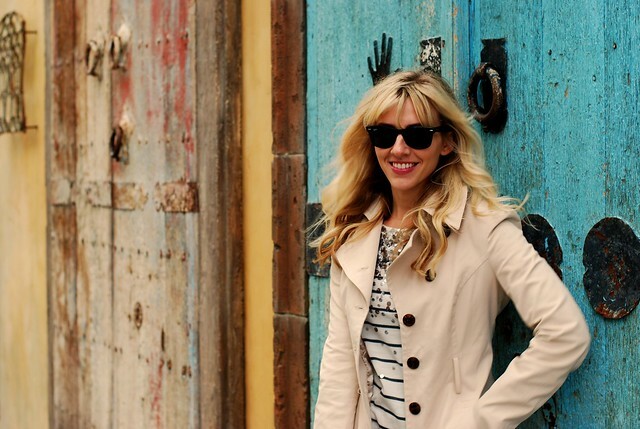 Everything good in life is there -- stripes, sequins... And that trench! And those flats! Maybe my favorite outfit yet, love. Great outfit.. You really can't go wrong with stripes and sparkle!! Love love love this outfit! So classy with the perfect twist found in sparkles galore! great combo, sequins + stripes - love this look! The top is really perfect! The stripes and sequins look so pretty together. you look great! i love this whole outfit! and you reminded me that I reallllly need to purchase a trench. You really can't go wrong with such a lovely combination as flats, dark skinny jeans and a striped shirt topped with a trench and classic Ray-Bans, but somehow you made it look extra appealing! Also, I probably have enough striped items to only live in them, but this sequined top really speaks to me! It's definitely high time for a perfect trench. I have that knit version of that top from J.Crew- it goes with so much! Love this casual chic...people who wear heels to shop are crazy...it CANNOT be comfortable all day long. LOVE! The sweater is the perfect combination of awesomeness! You & Bee (atlantic pacific) are shirt twins today! So cute! And I love that you frequently rock flats... I feel so much more natural/comfortable running around in a cute pair of flats, it's inspiring to see someone who still looks so well put together wear them, too! You look great and gorgeous as always, I love that combo as well, so pretty :) I love your trench -- I've always wanted a classic trench! I also love the location you took your pictures at! A gorgeous background and gorgeous look! I love your sweater!!!! Really cute! I agree, stripes and sequins are two of my favorite things, even better when put together. This sweater is fantastic! What a chic and sophisticated outfit! The sequined and striped JCrew sweater is perfection. And you look like a doll with those flats! 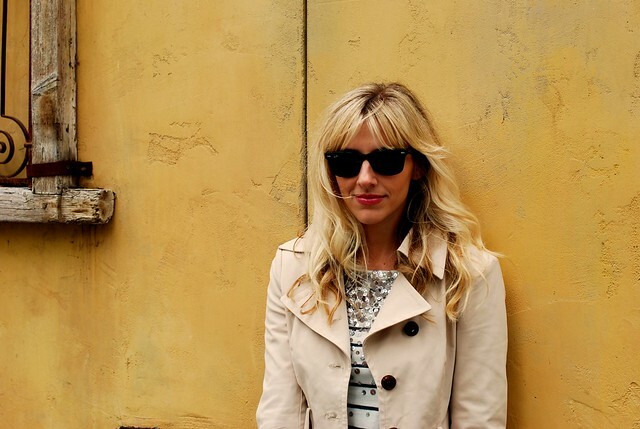 This post reminds that I'm still in pursuit of the perfect trench. I've never owned a light weight one before! Adore this outfit!! It's so classic and fun!! I've been eyeing Tory Burch lately too! I find her flats very classic and comfy. I've noticed stripes are everywhere lately..and I love them! that top is so cute! and i love the fit of your jeans. i need to get myself a pair of those. Marc and I snapped one of our Christmas photos at that lovely little door. That whole alley is the perfect place for photos, the doors, sidewalk etc. Love this outfit of yours, too cute!!! Thanks everyone. This outfit is just too classic not to go wrong --then add the sparkles and you have that fun factor. I love it! @Carloine-- got to love SR for great spots for photos! Adorable! Obsessed with the top- perfect transition piece. Adorable! The sequins make this so special. I fell in love with that sweater when I saw it in the J. Crew lookbook! You styled it so perfectly! i've been craving that jcrew sweater!!! oh my gosh best shirt ever!!! and that bag!! skinny jeans flats and striped shirts and literally my uniform too. Hi there! I wanted to know what style number the ray ban sunglasses are that you are wearing. Thanks! Love this look! I lusted after that sweater for months and decided against it (complete budgetary reason on that one). I love love love flats. Mostly because I walk around the city so much and I'm not into my footsies hurting. such a simple, classy look. i havent gotten dressed yet today -- but i think i know what i'll be wearing! @Tiffany my Ray-Bans are style #RB2140 ?? that's what it says on them. Fabulous top! It's only fitter that you wear that as you are THE Glitter Girl! Also, I LOVE that blue door/background! Fabulous-o! great look Taylor!! i also wanted to comment on the background for your photos - it's so rustic and fun. i think i'd want to wear that sweater ALL THE TIME if i had it. i love the Bebe coat too - i just picked up a fire engine red trench coat from Forever 21. Very classic casual look; I like it very much! I gasped when I saw your outfit! My 2 favorite things, sparkle and stripes. You look so classic and chic! SO YOU!! :) Too cute! Stripes, sequins, camel trench...foolproof outfit for Sunny spring weather...casual and chic- Loving this look on you...Topped off with wayfarers?! Classic...LOVE! I LOVE that bag! What a great outfit. I love everything about this outfit! Stripes and sequins, why not?! I always, always wear flats :) Comfy and fashionable is key when working at a library or museum. You are right-- stripes and sequins are the best duo. LOVE this look! Thanks ladies!! Glad you like the combo too! I love sequins and stripes! Together they look amazing! where ever this location is, it's absolutely beautiful! Your sparkly top is the perfect touch and perfect amount of sparkly! The J.Crew sweater is to die for. Everytime I go in I melt over it. Not sure why I haven't bought it nor tried it on, but it's just so pretty that I just want to look at it. Hahahaha... fashion daze! Love the look toned down with the trench! That sweater is stunning! :) This outfit looks so classy and elegant. love the outfit. i am also a flats wearer more often than not. This is my favorite item from the Jcrew spring collection--I just love it! Ah! So jealous you got that top! This outfit is perfection! @DiamnondsandTulle Thanks! It's my new favorite!! this look is absolutely everything! I would/ could totally rock this everyday!! Taylor, we're sweater twins!! I saw this on the website and drooled over it for awhile. I didn't think sequins were a practical purchase, but when the sweater promo came up, I said it's mine. I wore mine last week and I love it, love it, love it. Such a fun piece to wear and make the day feel more special. You look great in yours! I wish I could be the kind of girl who could prance around all day in heels (especially a skinny heel), but my feet like the flats too much. I love classic outfits like this! They're always so chic looking. such a cute look! love the bag too! This outfit ACTUALLY makes me speechless. love everything about this outfit... I need a DIY on your hair in these pics, looks fabulous.